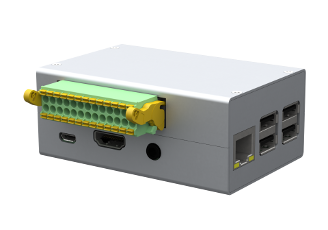 The Monarco HAT add-on board turns the Raspberry Pi minicomputer into a PLC/PAC or a mini industrial PC (IPC) and allows you to use it in your automation project. Analog and digital inputs and outputs follow industrial standards and work well with commonly used sensors and actuators. 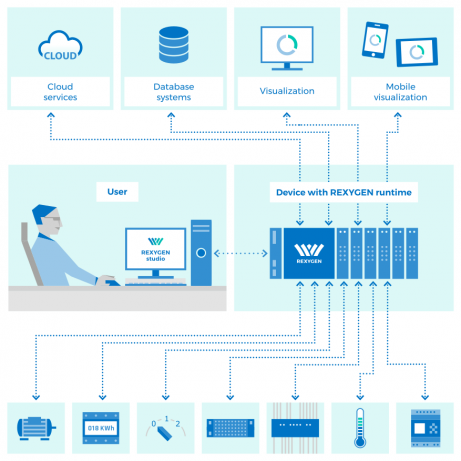 RS-485 and 1-Wire buses allow connection of additional I/O units, sensors and various devices like servo drives or energy meters. Unbeatable price to performace ratio, ideal for education and training. Excellent platform for proof-of-concept prototyping and for low-cost automation projects. Raspberry Pi models B+/2/3/3B+ supported. The runtime core of the REXYGEN system turns your Raspberry Pi into a programmable device which will run your algorithms. The REXYGEN system offers a graphical development environment for programming the algorithms. You can use standard desktop or laptop PC. You create the algorithms from the so-called function blocks (*). The library includes countless items (timers, comparators, filters, PID controllers and many more). Learn more about REXYGEN Studio. 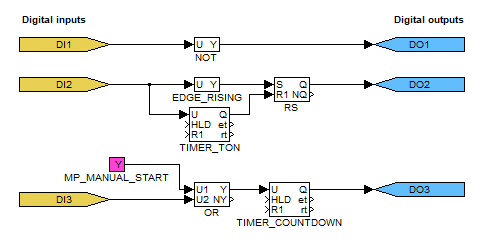 *) The IEC 61131-3 standard defines Function Block Diagram (FBD) as one of the PLC programming techniques. Human-machine interface (HMI) for your project? Checked! The built-in webserver of the REXYGEN runtime core turns the device into an all-in-one solution. Our HMI frameworks rely on HTML5 and work in all common browsers on Windows, macOS, Linux, iOS and Android. You can use an automatically generated HMI for your desktop, tablet or smartphone. You are also free to design your very own HMI. Buy a permanent licence key for your device. With a licence key your algorithms will run without any time restrictions. Get a free demo licence key for evaluating REXYGEN with your Monarco HAT on Raspberry Pi. The demo licence key allows you to run almost any algorithm on your device. The run time is limited to 2 hours. Anytime you wish to continue testing, you need to restart your device to get another 2 hours. Your algorithm will not start automatically upon restart.